There is energy changes when a chemical reaction takes place. The energy is in the form of heat, could be released or absorbed during the chemical reaction. The chart below shows the difference between this 2 reactions. Exothermic reaction is the chemical reaction that releases heat to the surrounding. When energy is given off during a chemical reaction, the temperature of the surrounding will increase. Dilution of concentrated sulphuric acid/ concentrated nitric acid or others acid in water. 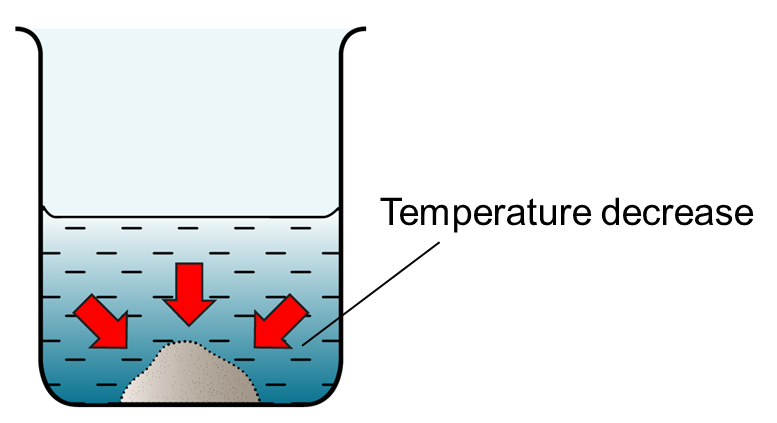 Change of state from gaseous state to liquid state and liquid state to solid state. 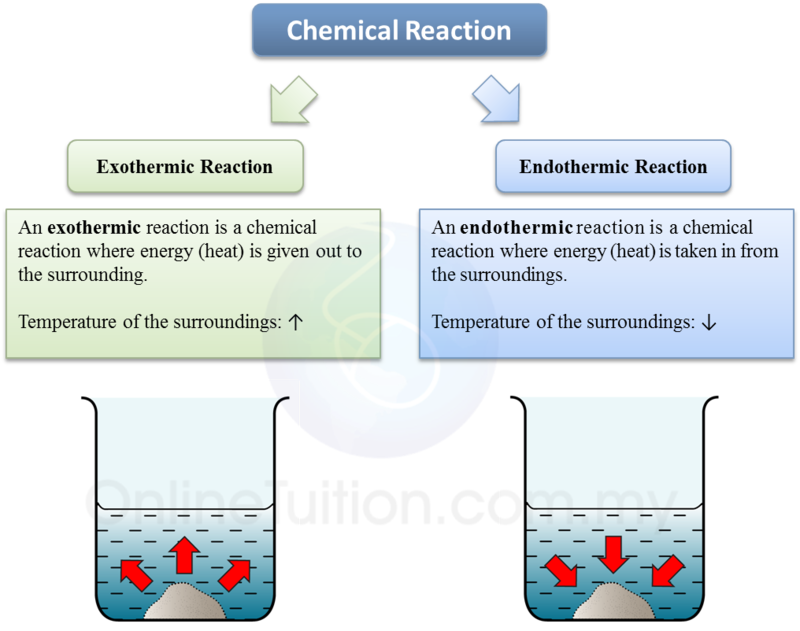 Endothermic reaction is a chemical reaction that absorbs heat from surroundings. When energy is taken from the surrounding during a chemical reaction, the temperature of the surrounding will decrease. Dissolve potassium nitrate, ammonium nitrate or ammonium chloride in water. 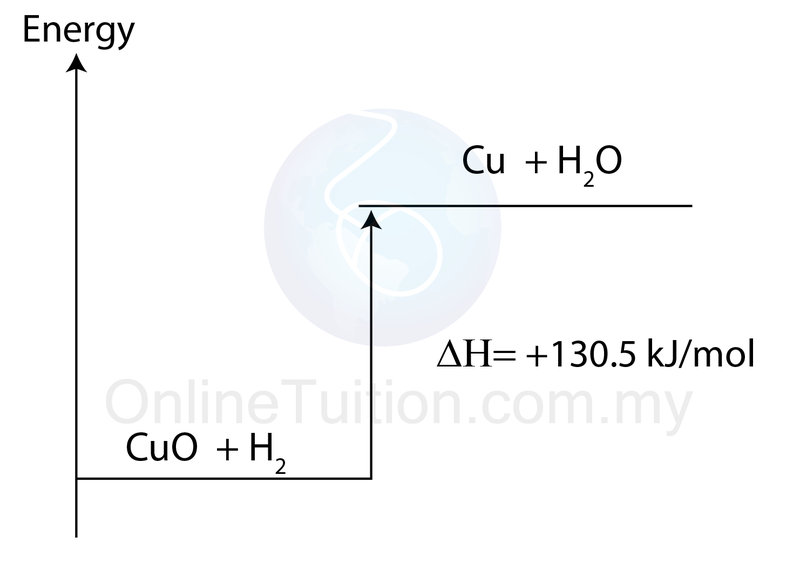 Reaction of heat on hydrated copper(II) sulphate. 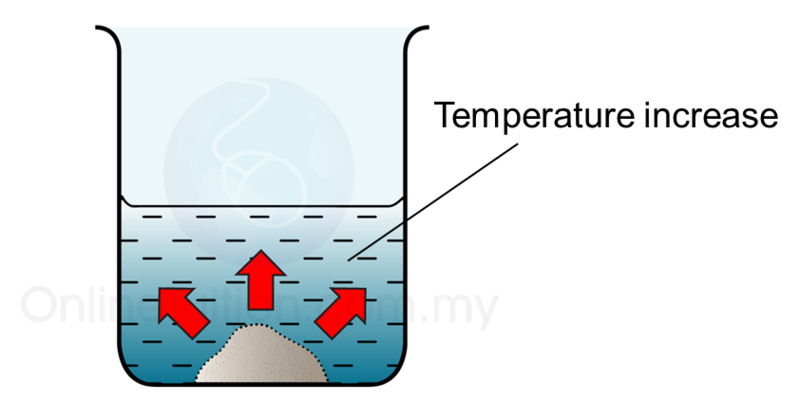 Change of physical state from solid to liquid or from liquid to gas. When a chemical reaction occurs, certain amount of heat is given off or absorb. 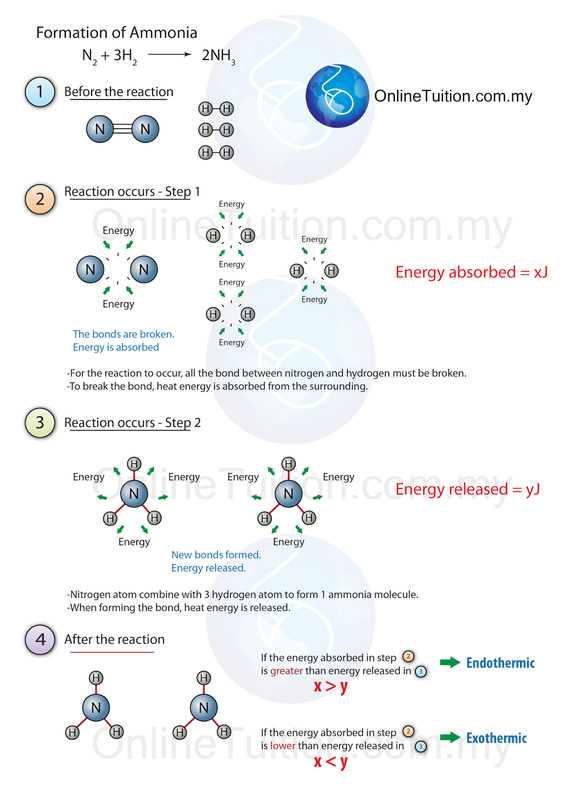 The energy change in the chemical reaction can be presented by an energy level diagram. 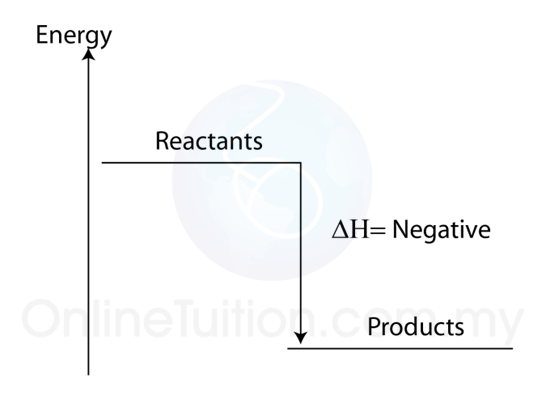 An energy level diagram it is a graph that shows the energy change in a chemical reaction. 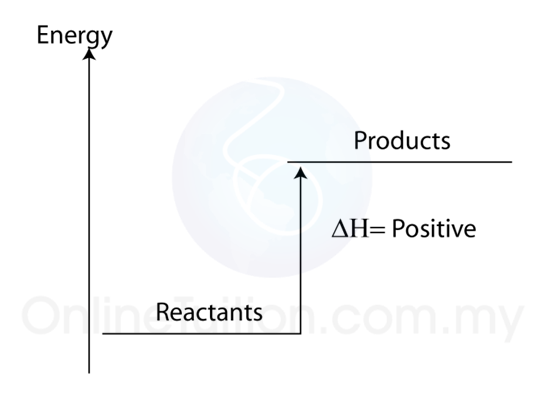 Figure below shows the general energy level diagram for exothermic reaction. We can see that the energy decreases after reaction. This is because energy is given off during an exothermic reaction. 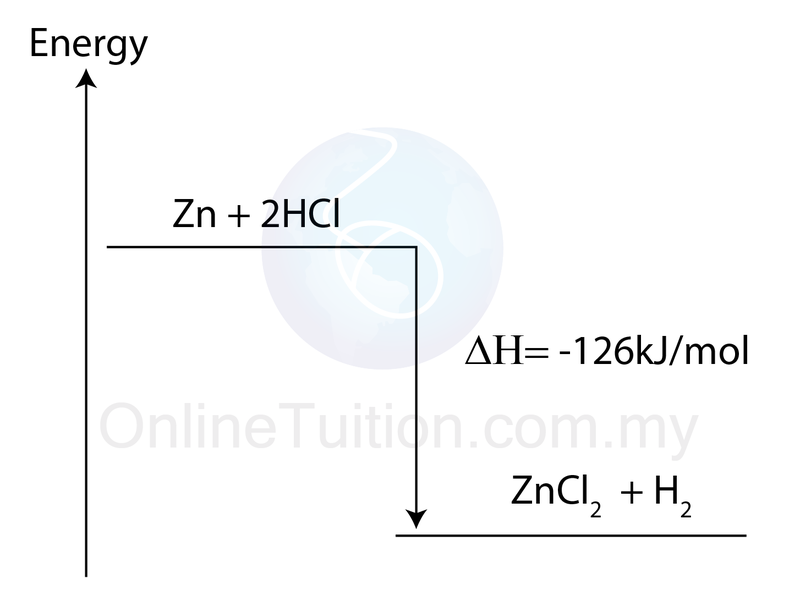 Figure below shows the general energy level diagram for endothermic reaction. The energy increases after reaction. This is because energy is absorbed during an endothermic reaction. During a reaction, energy must be supplied to break bonds in the reactants, and energy is give out when the bonds in the products form. The amount of energy that absorbed or released depends on the strength of the bond. If the amount of energy released during the process of creating bond is higher than the amount of energy that taken in during process of breaking bond, the reaction is an exothermic reaction. If the amount of energy been absorbed to break the bond is higher than the amount of energy been released during the formation of chemical bond, the reaction is an endothermic reaction.